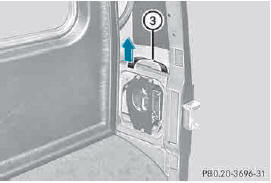 The emergency release is located in the cargo compartment, on the right-hand side when viewed in the direction of travel, behind the rear panel trim. The vehicle body in the emergency release area has sharp edges. There is a risk of injury. 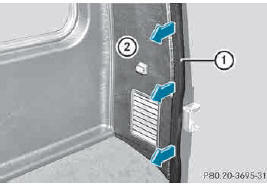 Avoid contact with the edges on the inside of the vehicle body. ► Open the rear door. ► Remove edge protection 1. ► Remove rear panel trim 2. ► Pull emergency release 3 in the direction of the arrow. The fuel filler flap is unlocked. ► Open the fuel filler flap.